After long back and forth and improvements here and there, I have finally uploaded a version of cjk-gs-integrate to CTAN. This coincides with the first test releases of the Ghostscript for MacTeX packages, which contain pre-generated settings for the CJK fonts shipped on recent Macs. Many thanks goes to Bruno Voisin, who has done incredible work in researching and testing setups. Without his contributions this package would not have come into existence. TeX Live does already contain the package starting from tomorrows update. 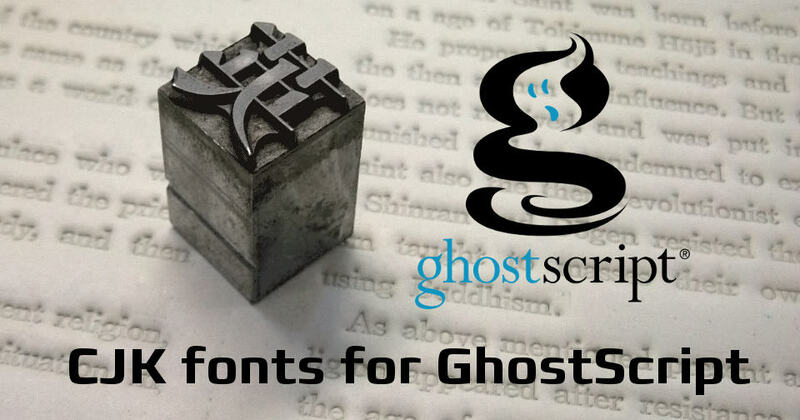 So if you are in the need for CJK fonts in Ghostscript, head over to the main page with description for explanations, and get going! selection by families: Already now the fonts are grouped by priorities into families, but it is not easy to tell the script to use all fonts from one family as representatives if they have lower priority than others available. Currently, the necessary way is to add --alias FooBar=SelectedFont for each single font. I want to add an option --jfam foo that selects for Japanese fonts those from family foo, like Morisawa, Hiragino, etc. cooperation with kanji-config-updmap: By now these two are completely independent, but in fact they need the same information, namely which fonts are available and which should be used. One idea is to merge the functionality of kanji-config-updmap into the current script (renaming it), and auto-generating map files on the fly depending on the fonts found/selected. Interoperability with the pre-shipped files from Ghostscript for MacTeX: While we have done the most important step in creating the same config files and links in the same directories, actual usage pattern and input from others need to be taken into account how this actually works. Input from CK font professionals: For Japanese we have a quite complete and well working setup, while for both Chinese as well as Korean we simply miss the know-how. Hopefully one with know-how steps forth and helps us a bit.